Use these websites and databases to find high quality information on any topic. Many of these are subscription resources that require you to log in; stop by the media center or email us for username and password information. Need a news article or image for a presentation? Scroll down. 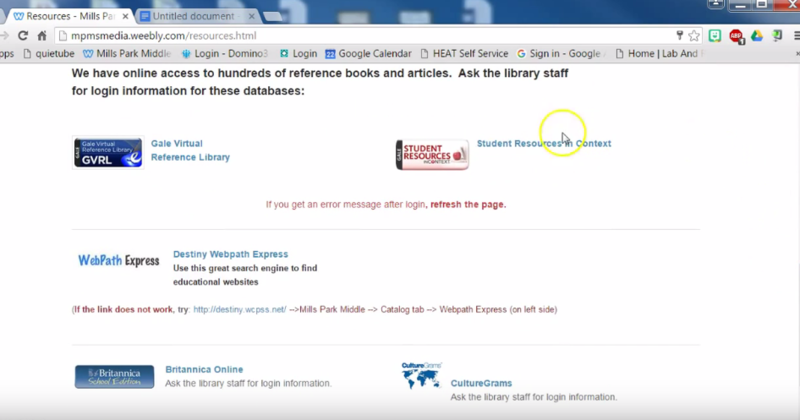 Watch the video to learn how to use Gale Virtual Reference Library, Student Resources in Context, and WebPath Express, then use the links below to find high-quality information on your topic. Click here for the Guided Notes Sheet that goes with this video. Have you already used GVRL, SRiC, and Webpath? Watch the SHORT video below for a quick refresher on what to do. ﻿​If you get an error message after login, refresh the page. Ask the library staff for login information.